Blog | Sand Rock Angus | Timeless Quality. Innovative Methods. Welcome to the Sand Rock Angus selection of yearling bulls for spring of 2018. We have another great pen of bulls available for purchase through private treaty. There is a bull for everyone in this pen, as we select bulls for breeding based on individual females. Three years ago we implemented the 50K genomic test, and this last year we went with GeneSeeks new high-density test. We want to bring the customer a clearer picture of how our cows are performing and how they can expect Sand Rock Angus bulls to improve their herds. DNA and Genomic testing is the future of the Angus and cattle industry. We are using these high-tech tools to improve our herd. We strive to breed cows that are feed efficient, good disposition, moderate birth weights, fast growing calves with higher weaning weights, and higher grading carcasses. Good bulls begin with good cows. We want easy keepers that produce a nice calf year after year. There are many factors that are important to this end. We use the tools available to improve our herd and we hope to improve the producers too. We have been impressed with the carcass data epds coming back on this year’s bulls. With improved accuracy from the genetic testing we have been able to make noticeable changes in expected progeny differences. There was a class put on this winter in Broadus by John Patterson from GeneSeek and Kelli Retallick with Angus Genetics Inc. for regional ranchers. Commercial producers are starting to see the value of genomic testing their heifer calves, and some have started testing to take advantage of the best genetics available. Thirty years of artificial insemination have helped us to grow a moderate framed herd that is feed efficient while still weaning off bigger calves. These bulls are bred to be well adapted to our Montanan climate and grass. Advance your herd’s genetics with Sand Rock Angus Bulls. We hope to see you out at the ranch! Welcome to the Sand Rock Angus selection of yearling bulls for spring 2017. We have another great pen of bulls available for purchase through private treaty. There is a bull for everyone in this pen, as we select bulls for breeding based on individual females. We have implemented the Zoetis i50K Genomic test for the last two years to bring the customer a clearer picture of how our cows are performing and how they can expect Sand Rock Angus bulls to improve their herds. Thirty years of artificial insemination have helped us to grow a moderate framed herd that is feed efficient wihle still weaning off bigger calves. 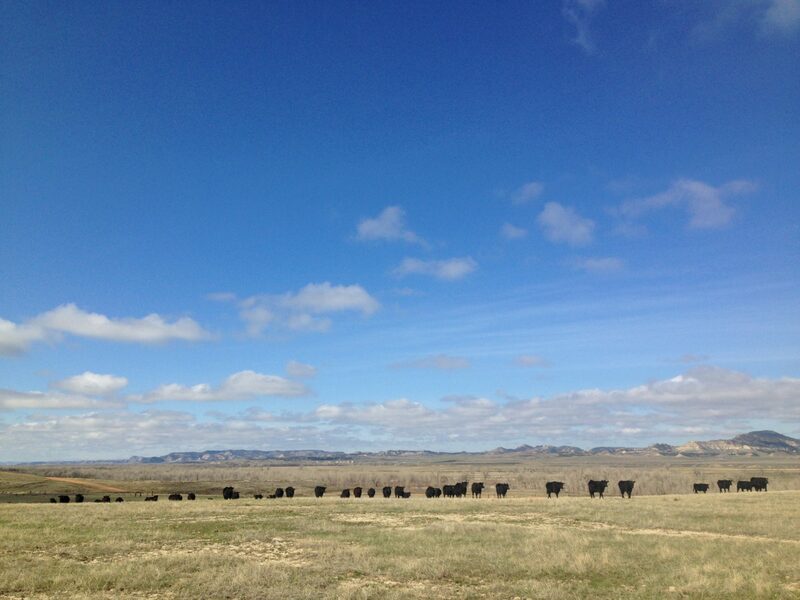 These bulls are bred to be well adapted to our Montana climate and grass. Advance your herd’s genetics with Sand Rock Angus bulls. 1) Genetics: For 30 years we have used genetics that work for our dry environment. We want cows that take less feed, breed back, and produce a good calf under poor conditions, or an excellent calf in good conditions. We try to stay on the positive side on our Cow Energy Value ($EN). $EN is the energy requirements expressed in dollar savings per cow, per year. It is possible to have a great looking cow that is efficient, we haven’t sacrificed carcass to accomplish this. 2) Calving Ease: Calving ease is something we have bred into our herd from the beginning with very few calving problems. 3) Fertility: We have always chosen A-I sires with correct confirmation and high scrotal EPD’s. Your heifers will look nice and be fertile. 4) Docility: Docility is a must, with no exceptions. We guarantee their dispositions will be good. We hand feed everything, every single day we are in with the bulls. Our ranching community is getting older and there are fewer of us, we can’t afford the time to be hurt. Come and see the bulls, walk in amongst them and see the difference for yourself. 5) Feed Efficiency: Our bulls are fed a balanced hay based ration. They get some corn, some protein supplement, and no silage. They are better prepared to go on grass and get to work on grass. Their feet will hold up and so will they. 6) Genetic Testing: Our bulls are fertility tested by Clint Pedersen, DVM of Broadus Veterinary Clinic. Dr. Pedersen wrote his veterinary thesis on bull testing and does an excellent job. The bulls are vaccinated for foot rot among a number of other things. We have genomic tested all of the bulls and our replacement heifers. What this means is much more accurate EPD’s based on the actual genetic makeup of that individual animal. The 50K test by Zoetis gives us EPD’s that are equivalent to seven or eight calves out of one cow. This means more accurate choices than ever before for you. There are gene markers that identify what to expect from that bull: proof, not speculation. 7) Private Treaty Sales: We choose to sell private treaty over having an annual sale. You can come look at the bulls anytime when it is convenient for you and take your time in selecting your bulls. We’ll take you out to look at the cows and heifers as well if you would like. We also have photos available of the bulls online to help assist you in making your selections on your own time. If you buy a bull online we guarantee you will be satisfied with what we deliver.